Guide provides answers to questions such as "Will a complimentary jacket be offered on my cruise?" or "Do I need boots?" Jacket/Parka: Seabourn is pleased to offer a complimentary jacket for Alaska guests and a complimentary parka for Antarctica guests. Place your order now. Antarctica: Knee-high boots are essential on all Antarctica sailings where you will step into icy water during Zodiac landings. Antarctica: Insulated knee-high expedition boots and trekking poles are available with free delivery to the ship. 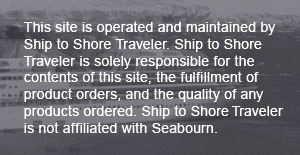 Onboard Delivery Option: Offered on select sailings. Enjoy the convenience of our concierge suite delivery service. Place your order before the order by date and select "Onboard Delivery" at check out.